Elcort - Ready Steady Gone! A while ago I received some great photos and stories all the way from Athens. Before I go into details about the subject and source of this memorabilia, let’s rewind just over four decades to the point where the swinging sixties had just swung past the half way mark. 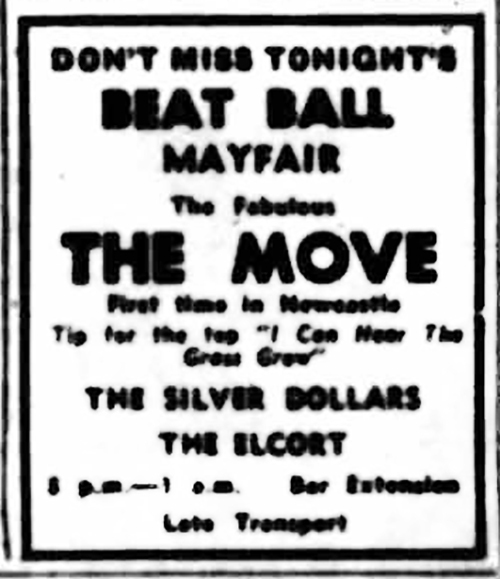 In 1965 and 1966 it seemed a certainty that one or more of three popular Newcastle bands would achieve national success. These bands had a huge following in the north east and all three had the musical ability and charisma to make it to the next level. First of all there was the Junco Partners, the resident band at the Club a’Gogo. Not only did the Juncos have a recording contract but they were also managed by the successful London promoter, Robert Stigwood. The second potentially up-and-coming Newcastle band was the Sect and last but not least was the Elcort who probably came nearer to becoming a successful chart band than either of the other two. 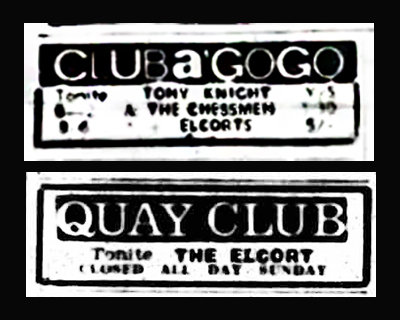 The memorabilia mentioned above was sent to me by the Elcort’s vocalist, Glyn Sadler who will be known to everyone who was connected to the north east music scene of the sixties and also many people who frequented the popular north east venues where the Elcort performed. Places such as the Club a’Gogo, Mayfair, Locarno, Majestic, Quay Club, the el Cubana and the Cellar Club. Glyn started his musical career as a singer with a Newcastle band called the Bright Lights in 1964. He left the Bright Light and joined the Heatwaves with Kenny Craddock. The Bright Light’s drummer was Brian Short who ditched his drums to become the vocalist after Glyn had left. Brian was later to become the front man with the Sect. Kenny Craddock went on to form the Elcort under the management of Derek Balmer and later asked Glyn to join the band which became known as the New Elcort. After a relatively short time the band signed with Parlophone records and in 1966 released a single called Tammy; a song originally recorded in 1957 by the American film star Debbie Reynolds for her movie of the same name. The band decided to record this song after hearing the Graham Bond Organisation cover it in the Jazz Lounge of the Club a’Gogo. For the B side they recorded Searching, which was chosen at short notice on the day they recorded Tammy. The Elcort’s manager at the time was Derek Balmer. Although he was good at dealing with the recording companies he wasn’t that familiar with the booking circuit and like most managers who think they have the best group, he sent the Elcort off on a four week promotional tour playing every night (and sometimes twice a night). The band toured throughout the country, from Newcastle to Manchester; from the Cavern at Liverpool to the Marquee and Scotch of St James in London. The band also took up a residency at a club called Sibylla’s in Marble Arch, London, which was apparently owned by one of The Rolling Stones. The residency came to an end one night after Brian Jones turned up at the club with three girls and as a prank pulled the electric plug out of the wall as they were leaving. According to Glyn, he was chased up stairs by the Elcort’s bass player Dave Eckhard who only stopped hitting Jones when he was told who he was. The Newcastle agent, Ivan Birchall eventually took over the management of the Elcort along with the Sect. Both bands became good friends and, along with their roadies, played 5-A-Side football together most weekends in the Majestic after it closed for the night but before the cleaners turned up. They also went to each others gigs if one or the other had a night off. Although Glyn was offered a recording contract as a solo singer (which he declined) he figured that there were too many great singers about for him to make it on a professional level. In contrast, a couple of the guys in the Elcort, Kenny Craddock and Paul Nichols, still had aspirations to make the big time in London. The outcome of these ambitions and Glyn’s preference to stay in the north east was that the Elcort split up. Kenny and Paul teamed up with the Sect’s singer, Brian Short and formed a band called New Religion. Rob Turner and Dave Eckhard joined the Pleasure Machine. Glyn and Derek Rootham joined the Sect. Glyn stayed with the Sect for a couple of years and was then with a band called Elmore Green for a while. New Religion didn’t make it but both Paul Nichols and, in particular, Kenny Craddock went on to bigger and better things. Amongst others, Paul was the drummer with Skip Bifferty, Lindisfarne and Widowmaker (with Steve Ellis from Love Affair). Kenny had a highly successful career as a session musician and musical director, working with many top artists including Ginger Baker, Ringo Starr, George Harrison and Van Morrison. Sadly, Kenny’s career came to an abrupt end when he died in a car accident in Portugal in 2002. His obituary in The Guardian is a great testimony to his talent and shows how much he was respected as a musician. Unlike the Junco Partners who are still performing in the north east, the Elcort’s career was relatively short lived, lasting less than two years. But they still remain one of the most remembered local Newcastle bands of the sixties. Who knows what might have happened had they found a suitable song to follow up their one and only single – Tammy? The reformed Sect in 1967 (left to right) are: Alan Atkinson, Glyn Sadler, Tom Duffy, Derek Rootham and Dave Corker. Definately muscians who were great in this area and some who went on to be Legends..Enjoyed The Elcort and Elmore Green..
i used to be a follower of the Elcort,first met them at ponteland memorial hall,my freinds and i used to follow them to every gig and we also bought tammy.it was nice to hear about them again.good times good memories!! Remember these lads Elcort well they had a great following and had every chance to make the big time. Saw Elmore Green as well who played the circuits Mike Shephardson lovely guy very un assuming but he could play a guitar. Great to see these pictures a great time some great musciand and singers came out of the NE. Remember seeing The Elcort playing at my youth club every Tuesday, (The Mera), about 1965, played Tammy every session, also used to do a version of In The Hall of The Mountain King, Sure Derek Rootham was with them, Can remember a drummer they had called Freddie Wheatley, went to school with him, saw him a few other bands,They were great times, Had Derek at the club I work at booking the entertainment, just a plug have The Juncos booked for 22nd May, Gosforth Empire Club. Hi Barry. Do you remember a young John Turnbull cutting his teeth at the MERA with his school band? nice memories - I played all those venues and knew most of those guys - truly magic times. I remember you from the 10th Avenue All-Stars, Charley. Have you seen the photo of of a very young Charley Foskett on the Jasper Hart page? Heard that Derek Rootham retired last Christmas, will be missed. What a time mid 60's in Newcastle, these lads were vibrant as were a lot of local talent around at that time. The Juncos, Gas Board etc etc and the Sect etc etc. I was told The Elcort recorded Tammy on Glyn's birthday at Abbey Road in Studio 3 on the day off The Beatles had whilst recording LP Rubber Soul. I remember hearing that The Beatles gear was in the studio and Lennon popped in. I am Ricky Tocher and was the keyboard player with Elmore Green ,Jub Jub Clique band,High Street East and The Jailbirds. I would love to meet up with Glyn Sadler and all the other people i played with like fred Reeve,Tommy Jackman,Micky Bennison.Brian Jarmy and all the others whose names i have forgotten. I was sorry to hear that Rod hood and Mickey Shepherdson were dead and jack Bickerton did not look too well the last time i saw him 20 years ago.. I would love to hear from any of them or if you know any of them ask them to contact me. Ricky Tocher, you mentioned Micky Bennison. Could anyone give some info on Micky's career? I believe he played in Geordie in 1977 alongside Brian Johnson (vocals), Tom Hill (bass) and Paul Swindon (drums) but I can't seem to find anything else about Micky. It’s funny. I am 72 now so I guess we're all getting on and we look back on what was a golden time for us. I really hope my former band mates and friends, particularly Glynn, Brian , Paul and Tom Duffy have equally good memories of great days together. I played with Micky Bennison in Jub Jub Clique Band and last time I saw him was 1967. However I know he was a member of the Bennison the Builders family and lived in Low Fell (in 1967). Also Alan, I have been in touch with Glyn Sadler over the last 2 years and he is well and lives abroad but hoping to meet him in January 2019. He certainly has fond memories of The Elcort, Sect and Elmore Green . I am currently looking for a lead and rhythm guitarist and singer to do a little jamming and have facilities and equipment. Have a Roland RD2000 incredible keyboards playing 8 instruments and drums where required but doesn't replace the real thing. Get in touch if anyone is interested. Hi Ricky - if you are meeting with Glyn in Newcastle in January I would love to join you. I spend a lot of my time in Spain but will be back in Newcastle from about 19th January. So it would be great to meet up. Ricky, thank you so much for the information. I will let you know if the meeting is taking place. Glyn is coming from Athens via Majorca to see his sister and I am away in Portugal for 2 weeks in Jan but if all together let's meet somewhere probably Newcastle. Are you still playing at all? Looks like you play lead or rhythm guitar. Brilliant reading all this about an era which won't be forgotten. Look forward to reading your notes should you meet up in January. Thanks Ricky - hope it works out for January meeting. I still play - with more enthusiasm than talent it has to be said. I have usual collection of old person trophy guitars (a Strat, a Tele, a 335 and a Fender acoustic - but wife limits me to a Fender 20 watt amp and a few pedals. If you have a guitar in UK and can get to Whitley Bay let me know. I have a sort of studio and amps etc. No need to be modest about your abilities. Barry will let you know about result of Jan. meeting. What connection do you have with Glyn and The Elcort? Hi Ricky, only connection is way back in 1965ish when the Elcort used to play at our youth club at the time. Went to school with then time drummer Fred Wheatley. It was him that got me in to playing drums which I did for 40 years mainly residencies after a spell with club bands. Knew Derek Rootham through club bookings when he was with various set ups. Can remember when The Elcort used to do In The Hall Of The Mountain King. Guy called Bob Smoult used to come on stage with a rope round his neck (no health and safety) when they did this number and chase the young girls round the club. Bob if my memory serves me right had something to do with the band at time. Last time I saw Derek was at Gosforth Empire Club a few years ago. Any info would be greatly appreciated as Bob Smoult suffers from the dreaded Alztheimers. Regards Barry Irwin. I have asked Roger Smith at Ready Steady Gone to give you my e mail address as it may not be safe to put these details on an open site. If you go to the home page and find "contact" you can e mail Roger at novamute@blueyonder.co.uk after which we can correspond privately because I would love to meet up with you and Roger Shehy for a session to see if we can make some decent sounds ..
Did some sail training a few years ago in Antigua going from English Harbour to Jolly beach and back. I have only just seen your post. I am meeting Alan Oliver on Monday to make some music. If it works and we need a drummer are you up for it? I have some drum pads. Sounds great.If things go well on Monday,definitely interested. Get those drum pads ready.